Murata has announced the commercial release of the world’s smallest ferrite bead noise filter, the BLMME Series. The new bead noise filters help reduce the size and increase the performance of IoT and wearable devices. Noise filters are a vital part of power supply circuits and signal circuits in today’s electronic devices. In some cases as many as 100 of these components are used in the latest smartphones, which are increasingly compact while delivering higher performance. In the interests of saving as much space as possible as devices continue to shrink, these noise filters need to be further miniaturized. Moreover, in the IoT area, where the market is forecast to expand rapidly following the launch of fifth-generation cellular networks (5G), communication circuits will be embedded in various small devices, which are expected to further increase the demand for ultra-small noise filters. World’s Smallest Size: With dimensions of 0.3×0.15×0.225 mm (L × W × T), the new products’ base area is 56% smaller than that of existing models. This helps reduce its footprint in electronic circuits substantially, thereby contributing to denser circuit design. Equal Characteristics and Performance to Existing Models Maintained: Generally, there is a problem in that the smaller ferrite bead noise filters become, the more disadvantageous the impedance and DC residence characteristics become. However, thanks to Murata’s microfabrication technique, the new products achieve an equivalent performance to that of larger conventional products. Sample shipments of the products have begun as the BLMME Series ferrite bead noise filter and mass production is scheduled to begin in June 2019. 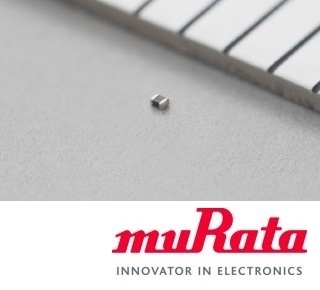 At the outset of shipping, a single type with impedance of 150Ω will be made available, and in future Murata will develop a wide array of products with diverse features to match market and specific customer requirements. Anticipated uses are not limited to smartphones but include a variety of electronic devices including home electronics, wearable devices, and electric vehicles such as self-driving cars, as well as drones and industrial machinery.